Three teenage boys from Los Angeles, CA, were surprised to find a Civil War encampment by the Little Fork Rangers in full activity when they arrived at the Graffiti House on the morning of Saturday, February 8th. 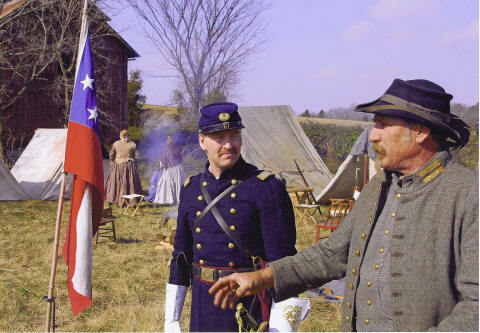 Charlie, "CJ" and Jack were even more surprised to learn that the Calvary unit had staged the encampment to enhance their study of the Civil War in Virginia. Charlie's mother, Laurie Waterman, was concerned that her son would not be able to fully comprehend the profound significance of the Civil War just from reading about it in his eighth grade textbook 3,000 miles away from where it happened. She called her longtime friend, Barbara VornDick, a teacher and resident of Orange County, to ask if she might bring her son and two of his friends for a weekend to visit some of the local battlefields and learn about the war experience. Thrilled at the opportunity to create a dynamic learning experience (a "lesson plan," if you will) for the boys, Ms. VornDick agreed it was a great idea to bring the young men to the Culpeper area, which is so rich in Civil War history. Having been to Graffiti House many times since it was opened to the public, Ms. VornDick knew that having the boys stand in the same rooms, and on the same floors, where soldiers--some, no doubt, near their age of 14 years--had recovered from battle wounds 145 years ago would give them a sense of the human pathos and the struggles of the Confederate soldiers. That is why Graffiti House was to be the first stop on their weekend adventure back to the 1860's. 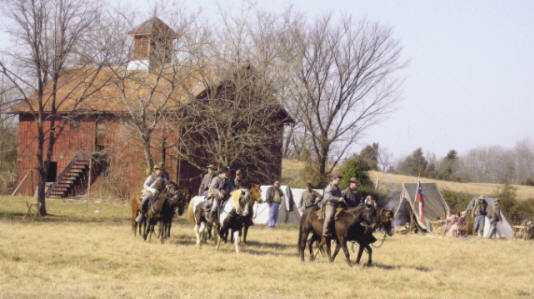 A call was made to the Brandy Station Foundation to ask if anyone there knew of a re-enactor who might volunteer an hour of his time to come to the Graffiti House in uniform so that the boys could see his uniform and weapons, and ask him questions, as it might make the experience more "real" for them. The BSF member said she would see what could be arranged, and that they would call back. About a week later Ms. Della Edrington of the BSF called Ms. VornDick to say that they had quite a sunrise for the visiting students. The entire Little Fork Rangers re-enactors were coming to set up camp at the Graffiti House, horses and all! Ms. VornDick was overwhelmed at this response to her request. All was kept secret from the boys until they arrived at Graffiti House Saturday morning and saw the cavalry practicing formations, and the tents set up in the field in front of the house. The commanding officer of the Little Fork Rangers greeted the young men and welcomed them to the camp. The California party presented the Little Fork Rangers with home-made hardtack, dried beef, and fruit cobblers; food authentic to the Civil War period that might have been offered to soldiers from local residents. The visiting Union officer, Col. Joshua Chamberlain, was an unexpected thrill, as just that morning his biography had been displayed along with other Civil War maps and resources at the VornDick home, and the breakfast conversation had been sure to include that because while Ms. VornDick's great-great grandfather had fought for the Confederacy, soldiers on both sides were to be respected for fighting bravely for causes they believed to be right. While details of the encampment had been kept from the California students, word quickly spread among friends and the party numbered 15 when all had arrived at Graffiti House on that brisk, sunny Saturday. A thorough, fascinating tour of the house was provided by Richard Deardoff, a teacher at Fauquier High School who had been expecting the boys and greeted them warmly. A hush fell over the group as Mr. Deardoff pointed out the signatures and relayed stories about the men who had been in that very spot over a century ago. To make the day a multisensory experience for the Californians, hardtack had been baked and Civil War lunches of hardtack and dried beef had been wrapped in cloth and packed for the boys, along with some plain, hot coffee to soften the "tooth dullers." A CD of Civil War era music played on the car radio on the way to Brandy Station, and a stop was made at the Rapidan River to retell one of Stringfellow's spy adventures near the sight where it happened. Each student had been given a binder of information about Graffiti House, and the other places they would visit during their 1860's weekend, and Charlie's mother, Laurie, made sure that all cell phones, ipods, and electric gadgets were "confiscated" so that the boys would truly experience the rich history lessons unfolding before them without the interruption of modern technology. Two of Ms. VornDick's children, son Lawton and daughter Beth, helped facilitate the weekend activities for the California students. Beth, an archaeological analyst at Monticello, helped in identifying artifacts and interpreting historical events. 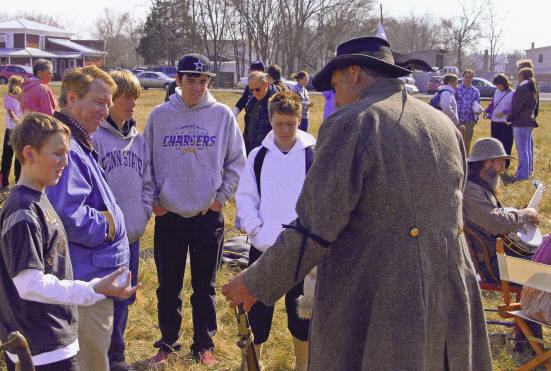 It was a wonderful experience for everyone, and all are most grateful to the Brandy Station Foundation and the Little Fork Rangers for this fabulous trip back in time. As Charlie said, "This is a day we will remember for the rest of our lives."